Devil May Cry is one of those peculiar mainstays of console gaming which a majority of PC gamers just don’t understand. Trust me, I know – I was one of those PC geeks who, for many, many years just didn’t get the attraction of the series at all. It’s just button mashing, right? It’s just a hack and slash. If it were a PC game, it would have been lost in the piles of awful, derivative drivel that fill bargain bins everywhere. A couple of years back though, I had some time to kill (read: I was at University) and decided to play through the original Devil May Cry. Then I realised something – the Devil May Cry series wasn’t just a boring hack and slash after all and the attraction of the game didn’t at all stem from the complex combos or play mechanics! Instead, the appeal came from the stylised approach to the subject matter – men with white, floppy hair and swords bigger than their egos exchanging cool witticisms in between fight scenes that would have made Chuck Norris’ jaw drop. Unfortunately, in the end I decided that watching prematurely grey, floppy-fringed twins fight to the death wasn’t exactly my cup of tea so, although I followed the reviews and the plot, I didn’t pay much heed to the series from then on. The latest and fourth instalment in the series got my attention though – delivering a new hero, new sidekick and a new ‘Devil Bringer’ weapon. With a chance to revitalise the series through a new story and character, was Devil May Cry 4 going to re-spark my interest in the series, or would it just be more of the same? The great thing about Devil May Cry 4 is that it doesn’t require any in-depth knowledge of the previous games. The story used here is as fresh as the new characters, so those of you wanting to get involved in the story but not wanting to wade through the extensive and forbiddingly tough back-catalogue of games need not fret. 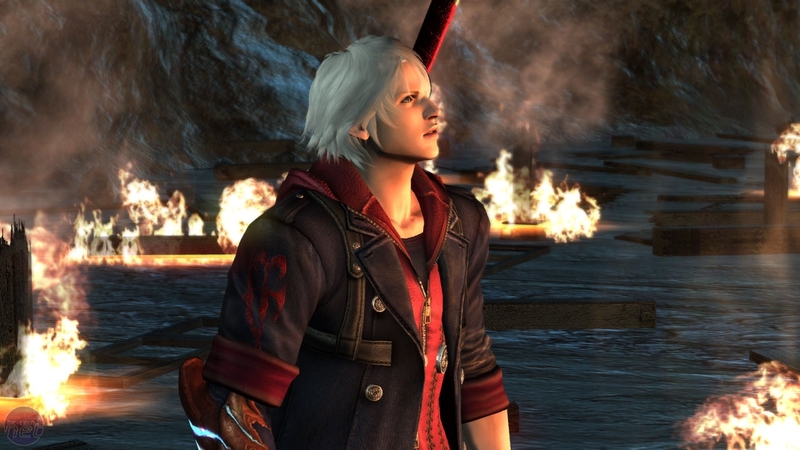 The new character introduced in Devil May Cry 4 is that of Nero, a cynical and rebellious young knight in the Order of the Sword. The Order is an ancient group of warrior monk types who long ago pledged to rid the world of demons, following the example of the demon turned man-protector, Sparda. Straight away, you can tell that Nero is the hero because although all the other knights are dressed in white uniforms, Nero is dressed more contemporarily and carries a fancy gun called Blue Rose. With headphones and an attitude standing out clearly against a sea of satin and celibacy, it's plainly obvious who the protagonist is. In fact, Nero is the spitting image of both Dante and Vergil, the twin brothers who were the protagonist and antagonist for the previous games. It’d be a bit rude of us to say if that impacts on the plot at all, but we will say that the similarities are remarkable. 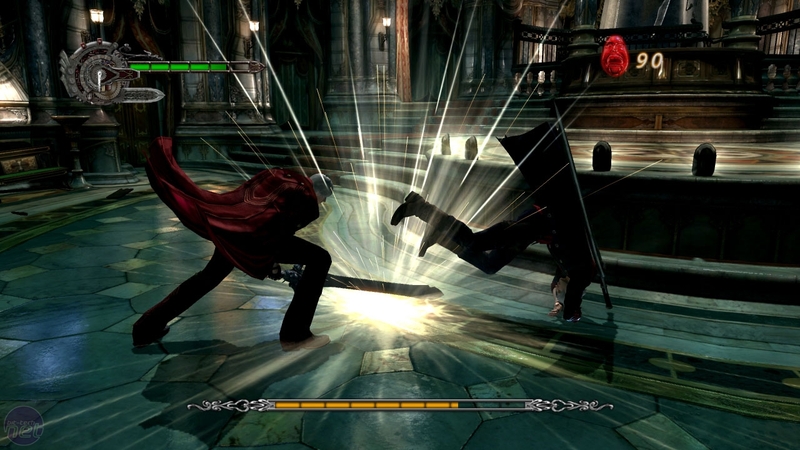 The resemblance actually makes the tutorial boss sequence a little tough too – as Nero and Dante fight, it’s hard to keep track of which is which. So, how do Nero and Dante come to blows? Well, in a typically dramatic style, Dante crashes through the ceiling of the Order’s temple and quickly executes the leader of the Order for no real reason – and just as he was giving a sermon! Just why Dante is taking on those who should really be his allies isn’t made clear and Nero doesn’t seem to care – he plunges into battle, going head to head with his lookalike. Unfortunately, just as Nero is getting the upper hand, Dante flees. Nero, delayed by a massive demon attack on the Order, sets off in pursuit as soon as he can and the stage is quickly set. Nero is pushed forward by a lust for revenge and answers. Players will mirror his search for the truth too – why has Dante turned against the Order? Why do the two look so similar and what precisely is the heritage behind Nero’s demonic right arm? A Western RPG from a team known for Japanese beat-em-ups? Is Dragon's Dogma a winning combo? Suda 51 has teamed up with EA to make a shooter that's every bit boring as it is insipid. With a new focus on four player co-op, is Lost Planet 2 four times the fun or just more of a mess?